Farmington CT and residents in Hartford County and the Farmington Valley area of Connecticut trust in NEC for chimney sweep services like chimney repair, chimney lining, chimney rebuilding, and chimney inspections across towns like Avon, Canton, Simsbury, Wethersfield, Newington and many more. Your neighbors in Farmington CT rely on Northeastern Chimney to service to their chimney systems, fireplaces, wood stoves, gas stoves and venting systems. We employ several crews of certified chimney sweep technicians that are professional, reliable, and highly-skilled. Every job is completed to the highest of industry standards, which is just one reason we have thousands of satisfied customers. Northeastern Chimney, Inc. has become a local favorite when it comes to chimney cleanings and repairs. There's a reason we've earned an A+ rating for chimney sweep service in Farmington CT and throughout our entire chimney service area. Thousands of satisfied customers in the Farmington Valley have come to love and depend on us for their routine chimney maintenance and cleaning. If you have a Leaky Chimney, you may notice moisture around your fireplace near the ceiling or inside your firebox call immediately for a Chimney Inspection before chimney damage gets worse. Leaky Chimneys and Water Intrusion are the main cause of chimney deterioration which can require chimney rebuilding if left unattended for too long. 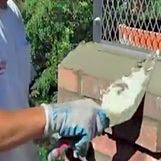 We stand behind our chimney service jobs and focus on providing top-notch service and outstanding work which is why we have maintained such a good reputation with locals. Our customers expect the best and our team of CSIA certified chimney technicians are here to deliver. From Farmington CT to West Hartford CT, Simsbury CT, Newington CT, and the surrounding areas, residents have been recommending us to their friends and neighbors for decades. Up and down State Rt 44, across Rt 6 & Farmington Ave, you will see our distinctively marked company trucks traveling on their way to deliver chimney services to local residents. Whether you need chimney repairs & restorations, chimney rebuilding services, chimney relining, chimney cap installations, or any other chimney sweep services, our certified chimney sweeps are always ready to help. Since the condition of your chimney and venting system is a matter of both safety and efficiency, contact Northeastern Chimney, Inc. to ensure that your chimney is functioning properly. We always respond quickly and always offer a fair, written estimate for recommended services. NEC is in good standing as a member of the National Chimney Sweep Guild (NCSG), and are highly qualified to service and repair fireplace & chimney systems. Buyer Beware! In the past few years, homeowners have been scammed by fake or amateur chimney sweeps that promise prices which are too good to be true. Although tempting, don’t be fooled by these “contractors”. Once hired, these untrained and uncertified individuals will arrive onsite to “clean” or “inspect” your chimney. Unfortunately, instead of delivering a complete & thorough job, they will focus on attempting to upsell the homeowner into expensive repairs. By claiming that these repairs need to be done “immediately” for safety reasons, they hope to scare the homeowner into believing they need to spend thousands of dollars on services that aren’t necessary. If you find yourself in this situation, DO NOT agree to any major services without a second opinion first. Contact a reputable chimney sweep company for a written estimate before agreeing to anything that seems amiss. It's better to be safe than sorry and when it comes to your safety, entrusting your chimney repairs and cleanings to a highly trained professional is a must. We handle all types of Chimney Services including chimney inspections, chimney cleaning, chimney relining, chimney caps, chimney crown rebuilds, historic chimney restoration and more. Top Chimney Sweep company in the Farmington CT area offering the service you deserve.